36 Lukie Points will be rewarded to you when you buy this. Authentic Pokemon Sapphire Game Boy Advance Game Cleaned Tested and Guaranteed to Work and Save! The race to catch 'em all is on again in Pokémon Sapphire. This entry in the Pokémon series features an all-new storyline, awesome new Pokémon, and addictive RPG gameplay. One of the biggest additions to Pokémon Sapphire is the two-on-two battle system, which allows you to link up with three friends to battle competitively or cooperatively. You can also showcase your Pokémon's coolness, beauty, cuteness, smartness, and toughness in Pokémon contests. 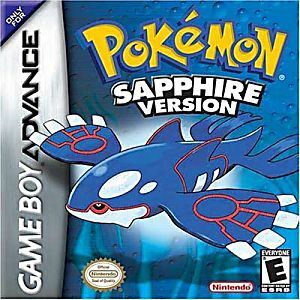 With new Pokémon, two-on-two battles, and an all-new region of Hoenn to explore, Pokémon Sapphire takes the Pokémon experience to the next level. Great item exactly what my son wanted for Christmas. Reasonable price. Will be buying from again. I absolutely love this game. This game came in five business days, and the staff was very helpful. There were no signs to suggest it was a fake, and there was a saved game already on the cartridge which meant it worked and saved perfectly. I will totally be buying from here again, and I really recommend it. The game is exactly what it says it is. It's not a fake which is awesome and it saves which is just as awesome. Sure, the battery's dry but that's expected of an old game and I can live with it. This was the first Pokemon game I ever played as a child so I'm very glad I was able to find it at a reasonable price. My daughter wanted this game because it was one of the first ones she ever played. As most of you already know, these are out of production now. I looked on Ebay and saw mixed reviews. The game arrived from Lukie games timely and worked as expected. I was very pleased and will order from Lukie games again in the future. I had this game growing up and I wanted a little nostalgia so I bought it and checked it out. The first day as soon as it arrived at my local post office I couldn't put the game down it was like I was 12 again!! Lukies have an unparalleled service they do here if your going to buy a game buy it here regardless of price or what people tell you. At least it will be guarrenteed to work 100.% right? What do you have to gamble. Nothing! Buy lukies for your next video game purchase you will not be disappointed. This was the first ever Pokémon game I played as a child and one of my personal favorites. Unfortunately that copy is long lost, and I first bought from eBay. The game turned out to be a fake, but then I found out of Lukie Games from a friend. The game is a great price for being hard to find. I received the game within 5 days and it is legit, and works perfectly! I will definitely buy from Lukie Games again. Checked everything out, 100% legit cartridge. Very happy to be able to get my hands on an original with the new wave remakes coming out. I know where to buy all my future GBA games from now! 99% Functional, but 100% Happy! When first turning on the game, it told me "The internal battery has run dry... blahblah". At first I was unsure, but it seems that the whole game is perfectly fine,barely affected by the dead battery. All in all, I cant grow berries, but I'm still pretty happy. Cartridge arrived in beautiful condition, couldnt ask better. Good condition, currently playing through and haven't had any problems. 100% Authentic Nintendo product, not fake. I've only ordered a few items from Lukie games so far but haven't had a single complaint. Hi i'm Patrick Moffatt and i am reviewing Pokemon Sapphire for the Game Boy Advance and i am so excited to play this game but i got a lot of Pokemon in this game i got Vulpix Moltres Umbreon Mew and Finally Torchic and i got a lot of Pokemon and i was very good at this game Because i win i defeat Meowth about again and but i can played on my Game Boy Advance SP to play this game because the game was very hard to find out and so i am reviewing Pokemon Sapphire for the Game Boy Advance Thank you. Good Game, Good Service. Battery is dead, but that happens. Sorry; we're going in reverse of the title. Like I said, the first thing it said was "The internal battery has run dry... blah dee blah..." All that means is berries don't grow, which is fine because you can complete the entire storyline of the game without growing berries, since they still appear when initially entering the area they're in. These cartridges are 10-12 years old; find me batteries that last that long and I'll concede. Though, I bought a different pokemon GBA game; its battery works fine, so yeah. I've tried buying these games from other vendors and they all sold me counterfeit games, which don't have dual-slot functions with the DS games. As such, I am very happy to have found a vendor with a 2 for 2 record of selling me the real deal. Besides that, the shipping time and it's pricing makes me very happy/not-as-broke. I like that. As far as pricing, the current sale prices are rather generous, but the strikethrough regular prices are very steep; I suppose it's planned that way, but $50 for LG and 60 for FR is uh... well. Yeah. Emerald I understand. As for the game. Read this(it's the point): 3rd gen pokemon games get a lot of flack because they're not the originals; personally I think they're great. They're the first ones I played all the way through though, so I'm biased. Unless you're one of those "OMG this one version is the only good version" you'll like it enough. Now, worth; that quality is up to you. I bought the game mostly for the dual slot function with the DS poke games. I have played through its counterpart, Ruby and ik they are virtually identical except for the antagonist; Team Aqua wants to expand the sea by waking the pokemon on the box cover, Kyogre. In Ruby, it was Team Magma, land and Groudon. I mean, you still need all the HM moves for both the Pokemon League and the Fight-the-bad-guys plot sequence; in that, it's every other pokemon game. I would def play through the game again, but I'm in college, I'm a little busy.